"We'll travel over mountains so high, we'll go through valleys so low. Still through it all we'll find that this is the greatest journey the human heart will ever see. The love of God will take us far beyond our wildest dreams." 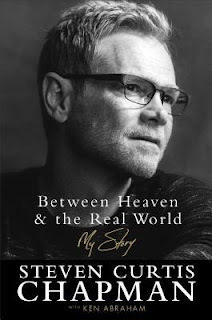 Between Heaven & the Real World is an authentic, emotional story of the life of Christian musician Steven Curtis Chapman. It is hard for me to add much to this review that isn't covered in the synopsis above. Gut-wrenchingly honest is the perfect phrase that comes to mind. From Chapman's growing up years, his relationship to Mary Beth and the tragic death of their young daughter, he doesn't hold back. There is more about his career here as well, the songs he has written and there meaning, the early days of his musical career right up to the adoption of his 3 daughters from China. A down to earth guy with the same struggles and challenges as everyone else, who is brutally honest and doesn't hold back when faced with a parents worst nightmare. I don't read non fiction as often as I would like and reading this one proved that I need to venture in that direction more often. Book provided courtesy of Baker Publishing Group and Graf-Martin Communications Inc.